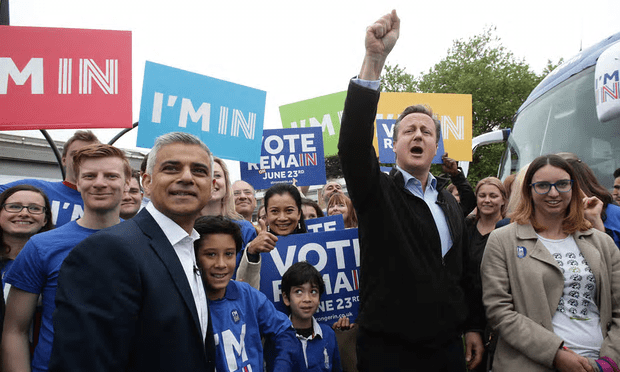 Never mind David Cameron – what about the shamelessness of Sadiq Khan? If Sadiq Khan likes Cameron so much (we know he doesn’t like Corbyn), how long will it be until he commits the ultimate disgrace and joins the Tories? [Image: Yui Mok/PA Wire]. If This Writer had been linked with extremism by a politician, the last thing I’d do is share a platform with him a few weeks later. Yet that is what Sadiq Khan has done – in direct violation of his party’s policy not to be seen campaigning alongside Conservatives on the EU referendum. Labour was stung badly during the Scottish independence referendum campaign, when nationalists claimed the party was campaigning alongside the Conservatives because there was no difference between them. The current policy seeks to prevent this from happening again. Khan has been an outspoken critic of Labour leader Jeremy Corbyn – despite the fact that he owes his victory in the London mayoral elections to the so-called ‘Corbyn effect’. This is how he repays his debt – by spitting in Corbyn’s face and appearing on a referendum platform alongside David Cameron, whose party linked him with extremism only weeks ago. It is a deliberate attempt to sabotage Labour’s campaign and confuse the voters. David Cameron has hailed Sadiq Khan as a “proud Muslim” just weeks after the Conservative Party launched a fierce campaign attacking him for alleged links to extremists. The Prime Minister said London’s new mayor was a “proud Brit” and shared a platform with him at an EU ‘Remain’ rally today, despite previously warning of Khan’s affinity with religious figures. Cameron notably came under fire for refusing to publicly congratulate Khan for six days following the mayor’s election – despite figures including Hillary Clinton, Sajid Javid and even the Daily Mail managing to do so. Very shocking and disappointing I have to say. What was he thinking going against Labour policy over this? To be generous, I could say he was acting magnanimously, but honestly, I think he was extremely foolish and this could come back to bite him. Firstly Khan did not win the Mayor ace because of anything to do with Corbyn. A wooden toy would have won under the Labour banner. Boris won because he is Boris. The polls at the end of the race showed that Boris would have won against Khan. Goldsmith was a very poor candidate and London is likely to elect a Labour mayor every time in the absence of a candidate like Boris. Khan is not looking like much of a Mayor in the event. He has already backed away from his house building promise several times under questioning by pundits and in the Assembly at Mayor’s Question Time. There is no reason why Khan should not share a platform with Cameron. The Mayor’s loyalty is to London and not Corbyn. If Labour members are not allowed to go against Labour policy then Corbyn is guilty himself as Trident and several other thing are currently Labour policy and he is ignoring that. The facts are against you. Khan won because of people who voted Labour after being attracted by Jeremy Corbyn. You’re not arguing with me; you’re arguing with the statistics. Did I not post this link in the article? You say Boris Johnson would have won against Khan. Do you realise that he would have needed to mobilise a greater amount of support than had ever voted in a London mayoral election previously? Johnson’s vote fell in 2012 and – given the campaign the Conservatives ran this year, coupled with the fact that people know Johnson for what he is – there is no reason to believe it would not have fallen again. There is one very good reason Khan should not share a platform with Cameron: His party’s directive against associating with Conservatives in the referendum campaign. You can’t try to discuss a mayor’s loyalty after mentioning arch-Tory right-winger Boris and expect to be taken seriously, surely? Labour members can rebel against policy if it is a matter of conscience, yes. This isn’t one of those cases though – for obvious reasons. I did read the linked to article. You mention the statistics contained in it. Actually the article is made up of personal views such as “I think” and “my hunch is”. There is only one solitary statistic in the whole article near the end, “Sadiq Khan got 57 per cent of the vote in Tooting – compared to 47 per cent at the general election.” It is not even remotely a scientific analysis of the campaign result. My view that it was a typical London vote for Mayor that Labour were always going to win as did Livingstone. My opinion is just as valid as that of the personal opinion expressed in the article. The article shows that Khan attracted votes from people who had been attracted to Labour by Corbyn. The opinion expressed in the article is based on the facts – and doesn’t actually differ from yours all that much. It’s simply that you have chosen not to believe that the Corbyn effect had anything to do with it. If that was the case, Zac Goldsmith would now be mayor of London. I have to confess that I am confused by this man. I hope he is not one of those who are “in it for what THEY can get out of it”. It is very important that we all support our leader Jeremy Corbyn who doesn’t fluctuate between right and left for the sake of convenience. At this moment in time I like to feel that Sadiq is simply taking advantage of Cameron for the sake of staying IN the EU. Most of the arguments have been well disproved but readers of This Blog are welcome to visit your site to see how unreasonable the right-wing opposition to Corbyn can be. Heck Phil, I can’t remember every comment you’ve made on here, but I thought you were a Tory! I didn’t realise you were on the Labour side (allbeit back in 2001). I’m assuming of course that you haven’t switched sides in the meantime? He’s extremely right-wing but claims to be Labour. I would describe myself as ‘True Labour’. A member for 30 years. Corbyn’s politics have never had any mainstream influence on Labour before 2015. He represents the views of the middle-class urban left, which developed in the late 70s and early 80s. Experiments at the GLC and a few London boroughs. Quickly disowned by Kinnock and largely gone by the late 80s. He is a throwback. A has-been. A never-was. My inspiration comes from people such as Attlee, Wilson, Callaghan and Blair. Leaders who were in touch with public sentiment and delivered progressive change. So you joined Labour after the right-wingers had cleared the Lefties out of most positions of authority and when they were beginning to change it into the neoliberal nightmare that would have repelled Attlee and Wilson, if not Callaghan as well. Not really ‘True Labour’ in the sense any historian of the party would readily accept, I think. Your description of Corbyn’s leftism is straight from the anti-Corbyn handbook used by far-right Labour and some Conservatives. In fact he doesn’t represent a throwback to the Left of the 70s and 80s. He is in touch with public sentiment – that’s why he has doubled party membership and delivered victories in this year’s elections where all the right-wing commentators said he was doomed. And he does promise progressive change. You may not recognise it as it is an offer of real progress, rather than Blair’s watered-down Conservatism. Presumably Labour politicians campaigning for Remain are trying to mobilise Labour voters to vote Remain .Appearing alongside Cameron immediately reminds Labour voters that voting Remain is something David Cameron wants them to do : something they need to put to the back of their minds if they are to do so .Is Khan being disingenuous in his support for Remain or is he just a bit thick ? I understand that people can have their differences, but after the massive racial/hate campaign that was thrown at him by Cameron/Goldsmith, does strike me as very bizarre that he has gone and done this! I voted for Sadiq Khan because we had to have a Labour Mayor. rather sceptical, I still, however, voted for Labour. Imagine my dismay when I read Sadiq’s comments on Jeremy Corbyn in immediate news reports. We have enough problems with divisions in Labour’s politicians without Sadiq adding fuel. I hope it has not gone to his head. Many of us voted for a Labour Mayor believing he would support our Labour leader, but I am disappointed in Khan’s lack of solidarity in his first interviews after the election; and now to stand with Cameron, seems to me a bit dodgy. Cameron had said Khan has shared a platform with people with extremist views during the mayoral election campaign. Cameron eventually apologized to a Muslim cleric he had accused of supporting the Islamic State extremist group and linked to Khan. After seeing this photo, it, more than ever, appears to me that Dodgy Dave has his finger on the pulse! He knows the majority know him to be an inveterate liar, and is using reverse psychology – believing that if he insists he does not want to leave the EU; we, in our perversity, will decide to leave! ….just saying…. Consorting with a known liar, a man without a shred of integrity, someone who had also basely and falsely attacked Khan, is going to do Khan no favours at all and then there is his incredible disloyalty to his own party. I was shocked to see Khan campaigning with Cameron. If he wanted to shred his own credibility, he couldn’t have chosen better.